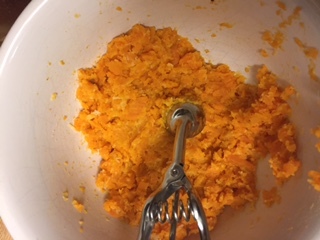 3In a food processor, pulse sweet potato until small crumbles form. 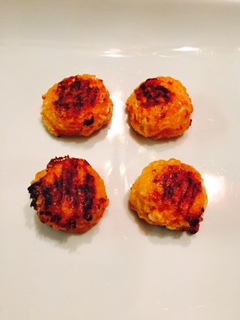 4In a bowl combine sweet potatoes and cheese, mash together with your hands until well combined. 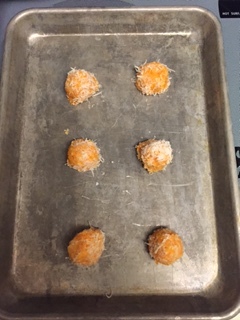 5Form into balls (I used a cooked scooper, shown above) and roll in parmesan until lightly coated. 6Place onto cookie sheet and bake at 425 Degrees F for 10-15 minutes, turning every 5 minutes to cook evenly on all sides. 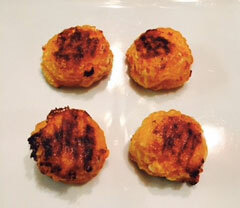 7These freeze very well, but freeze after rolling into balls-do not bake first.